The world's oceans are in trouble. The recently released Ocean Health Index gives our oceans an overall score of 60 on a scale of 0 to 100 - that's not good. Once thriving, clean, and full of spectacular marine life, the oceans are now full of pesticides, plastic trash, and oil.Like canaries in the coal mine, coral reefs have already begun to suffer the consequences of human carelessness. 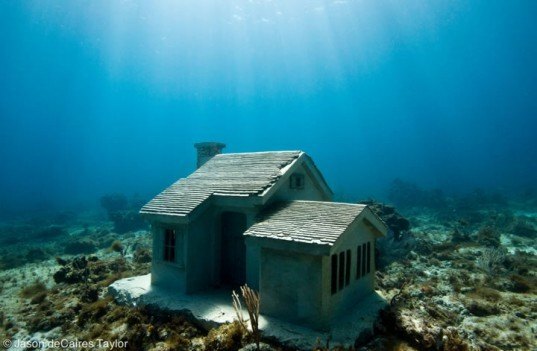 Rather than become worried or depressed, artist and underwater naturalist Jason deCaires Taylor has created a series of surreal underwater houses that will serve as artificial reefs to give ocean creatures a fighting chance. According to the National Oceanic and Atmospheric Association, carbon dioxide absorbed into the ocean from the atmosphere has already begun to reduce calcification rates in reef-building and reef-associated organisms by altering sea water chemistry. Also, as temperatures rise, mass bleaching and infectious disease outbreaks are likely to become more frequent. When a coral reef dies off, it puts an entire ecosystem out of business, forcing many different sea creatures to seek shelter elsewhere. 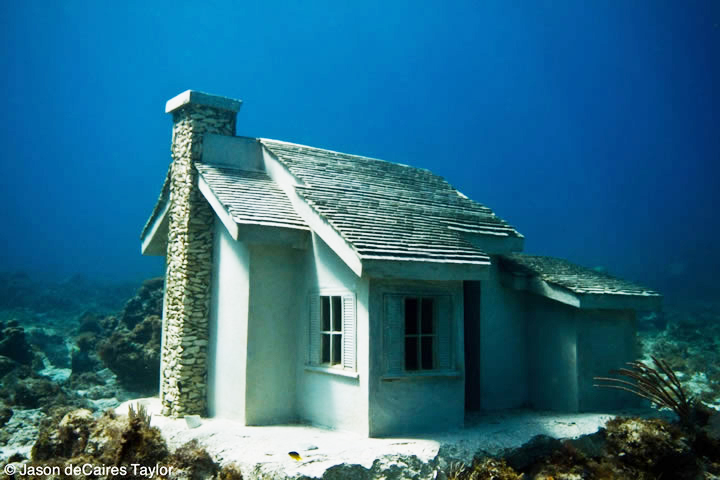 To help the reefs survive in the face of huge challenges, Taylor is constructing a series of underwater shelters. While the sculptures are meant to be inhabited by sea creatures, this latest series, called “Urban Reef” takes the form of homes you’re likely to see in your own neighborhood. According to designboom, the artist developed these installations with the guidance of local marine biologists. They are meant to shelter various reef inhabitants in several rooms and hideaways from predators such as lion fish and barracudas. The collection resides among some 450 sculptures in the rather vast MUSA (Museo Subaquatico de Arte) off the coast of Cancun, Mexico. Taylor created the world’s first underwater sculpture park, now listed as one of the Top 25 Wonders of the World by National Geographic, near Grenada in the West Indies, in 2006. "Once thriving, clean, and full of spectacular marine life, the oceans are now full of pesticides, plastic trash, and . . . inappropriately-designed artificial reef such as these. Oh,wait. . . might be a grim reminder to all concerning the impending threat of rising sea levels ! When will people realize that plopping more crap onto already struggling reefs is not going to help the situation. Doing so under the pretense of "art" or "conservation" is grossly misled. It doesn't matter if it's sculpture, discarded rail cars, or out of commission boats. It's human garbage and it doesn't belong there. There was coral, the same coral that's struggling to survive, crushed under each one of those concrete slabs. Nice going. According to the National Oceanic and Atmospheric Association, carbon dioxide (C02) absorbed into the ocean from the atmosphere has already begun to reduce calcification rates in reef-building and reef-associated organisms by altering sea water chemistry. Also, as temperatures rise, mass bleaching , and infectious disease outbreaks are likely to become more frequent. When coral reefs die off, it puts an entire ecosystem out of business, forcing many different sea creatures to seek shelter elsewhere. To help the reefs survive in the face of huge challenges, Taylor is constructing a series of underwater shelters. While the sculptures are meant to be inhabited by sea creatures, this latest series, called "Urban Reef" takes the form of homes you're likely to see in your own neighborhood. According to designboom, the artist developed these installations with the guidance of local marine biologists. They are meant to shelter various reef inhabitants in several rooms and hideaways from predators such as lion fish and barracudas. The collection resides among some 450 sculptures in the rather vast MUSA (Museo Subaquatico de Arte) off the coast of Cancun, Mexico. Taylor created the world's first underwater sculpture park, now listed as one of the Top 25 Wonders of the World by National Geographic, near Grenada in the West Indies, in 2006.